Six days of uninterrupted sewing, surrounded by beautiful fabrics, away from household responsibilities and sewing with a renowned expert sounds like the dream doesn't it? In reality it's exhausting! 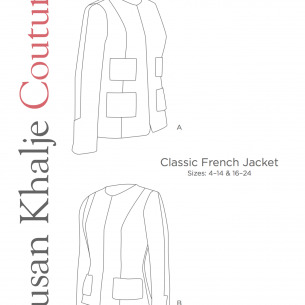 I spent all of last week doing the French jacket sewing course with Susan Khaljie and despite sewing from 8am to 6pm everyday I still didn't finish it. I don't have much left to do - I need to hunt down some trim to finish sewing on my jacket, put on the buttons and pockets and hand stitch the lining closed. Getting close though! One side has been fitted but not the other, which is why I look so lopsided in the above photos. The calico actually becomes the pattern pieces, so after this I pulled apart all the seams, pinched out the excess and got down to sewing the jacket. 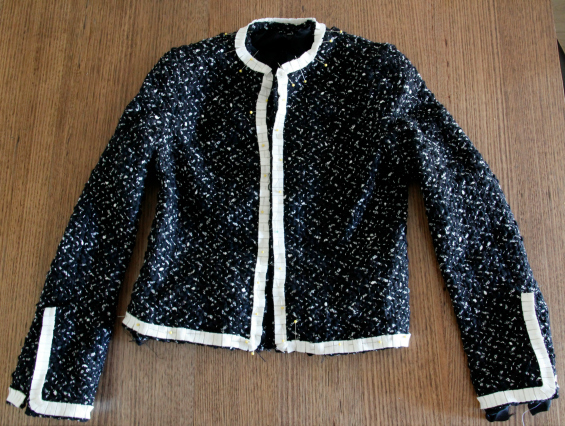 So why does it take so long to make such a simple jacket? 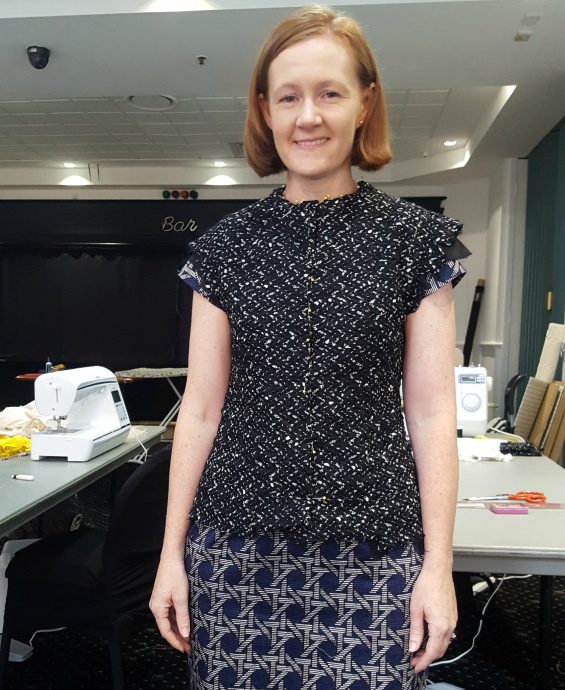 Some of the ladies in my class were sewing with the most beautiful Chanel fabrics that cost hundreds of dollars per metre and were ordered specially from Mendel Goldberg in New York. My fabric on the other hand, came from The Fabric Store during their recent sale and is an interesting wool/polyester mix but certainly wasn't very expensive. 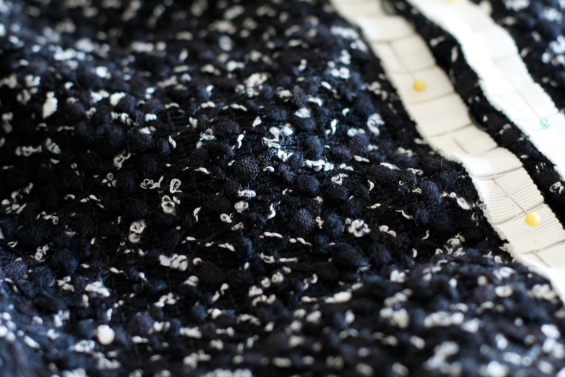 It seems to have black and white bobbly yarn topstitched to the fabric, so it's quite a textural fabric and is quite lofty which meant that the quilting stitches sank right into the fabric and are invisible. Finding trim and buttons though is quite the challenge. It's the key aspect of a jacket like this, and there are only a few stores scattered throughout the city and suburbs selling it which means it's quite a hunting expedition. 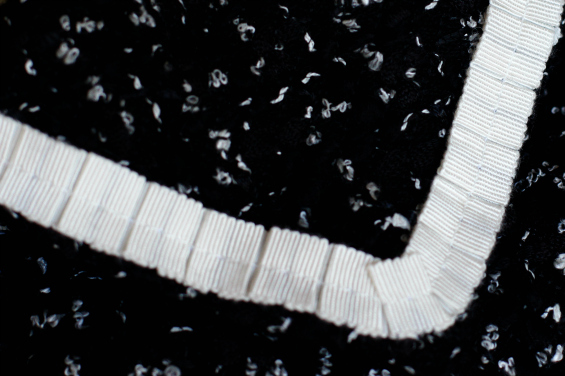 I managed to find some white grosgrain ribbon that had been folded origami style from Tessuti, but I am still on the hunt for some narrow trim to go down the centre of the white ribbon because it looks a little plain. So even though I didn't finish the jacket (actually no one in the course did), I've certainly learnt so much. 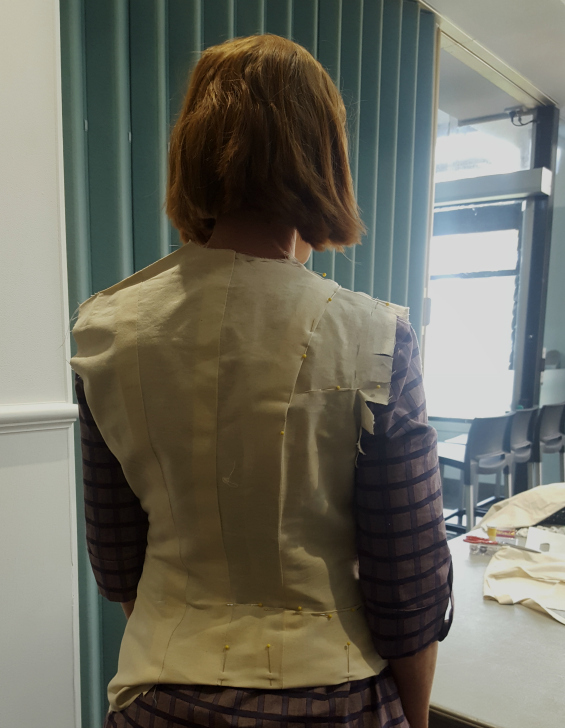 Whilst I think my sewing skills are fairly advanced, I'm a very functional sewer and in no way is anything I make couture - I like to do as little hand sewing as possible! 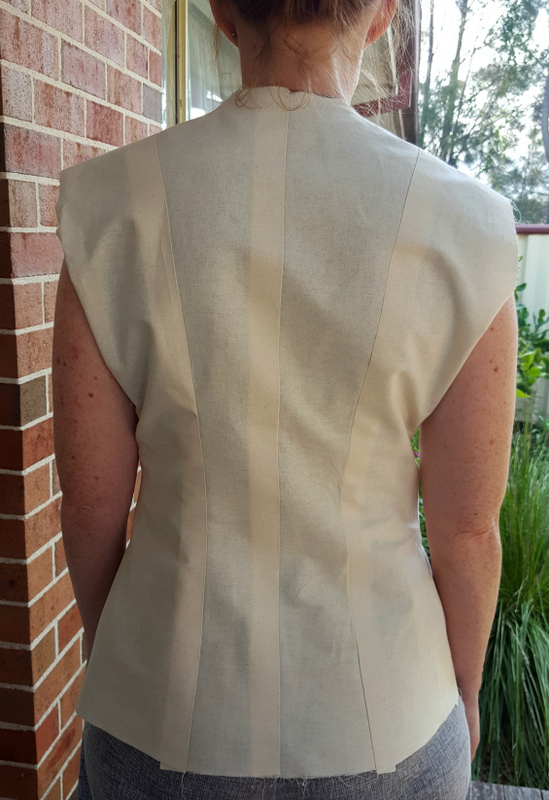 However, I have come to realise that a beautiful inside of a garment which neat hand stitches is a thing of beauty and that precision sewing after making muslins does result in a great outcome. Making multiple fitting muslins without getting much closer to a well fitting jacket is hugely frustrating and quite boring if I'm being honest. So to break up the monotony and frustration, I decided to whip out a TNT pattern using one of my recent fabric purchases. I've used this pattern many times over the last 5 or so years (see here, here, here, here or here for proof!). Sadly, all my previous versions seem to have shrunk in the wardrobe in the last year and are currently a little too snug to wear so it was out of necessity and not just procrastination that I made this latest version. This fabric is Tessuti's Bamboozled which is a lovely cotton/elastene that I bought recently from their Surry Hills store. After a pre-wash it didn't lose any of it's deep blue colour, crispness and nor did it shrink. I had bought it planning to make a pencil skirt, but because it was quite wide I managed to just eek this dress out. And check out that pattern matching at the sides - that always makes me happy. This dress came together super quickly thanks to my previous experience with it. 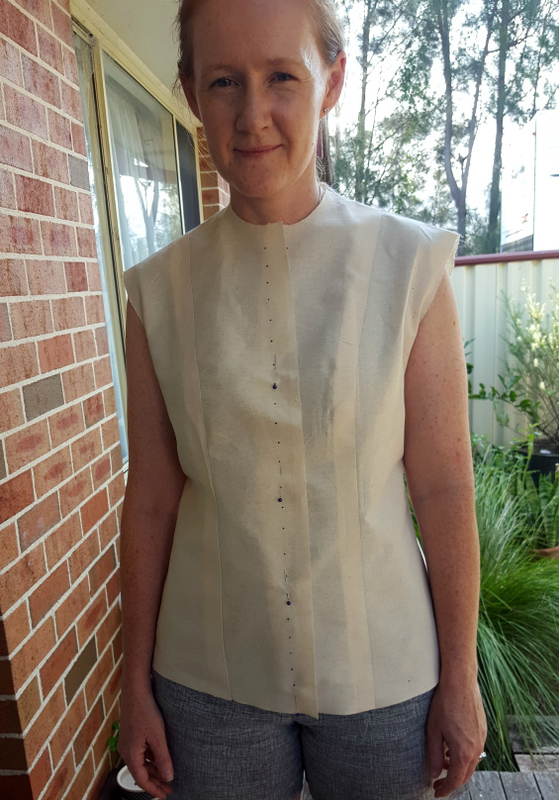 I chose not to line this version because the fabric is a dense fabric so there would be no issues with sheerness, but also because it's been about a billion degrees in the shade around here lately and I really wanted a cool cotton dress in which to swelter. Seriously, Sydney has had it's hottest every January with many days around the 40C/104F and nights above 30C/86F. As a pale skinned redhead, I just cannot cope with such heat and I am looking forward to winter (my apologies to those of you suffering through a bitterly cold winter right now). Despite those little niggles which is probably my vanity more than anything, I'm still happy with this dress and can see it on high rotation for the next few months. So after churning out a successful project you would think I'd get back into my muslin making with renewed enthusiasm. 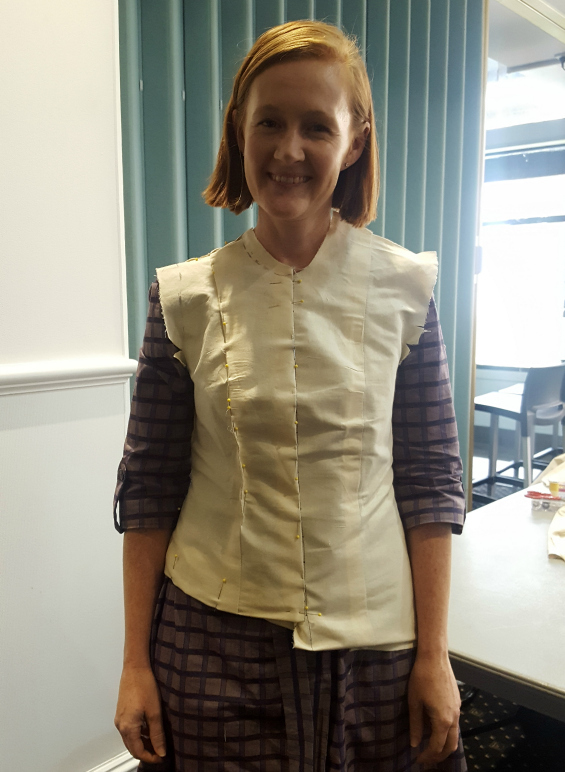 Well, it turns out that I'm at my most productive when I'm procrastinating and I've already made another dress (just need some buttons) and a skirt! I'll either be burning the midnight oil the night before the course or just go with what I have and get some much needed help on fitting.